The 48S14.250BC Bi-Directional DC/DC Converter is offered in 9.45 x 5.366 x 0.725 in. mechanically enclosed package. The unit is suitable for in-vehicle power distribution in 48V/12V battery configurations. It utilizes CAN-transceiver for communicating with microcontroller. The converter features a disconnect switch, reverse voltage protection and short circuit protection. It can be operated in -40˚C to 100˚C temperature and the base plate of the unit allows easy mounting to a chill plate or chassis. Calex Mfg. 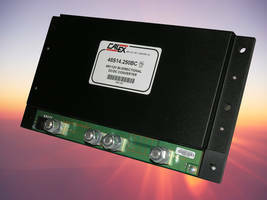 Co., Inc. announces the addition of the 3.5 kW Bi-Directional DC/DC converter to the Calex product offering. The 48S14.250BC Bi-Directional non-isolated DC/DC converter provides a complete solution for in-vehicle power distribution in 48V/12V battery configurations for a variety of applications including micro and mild hybrid automotive systems. The BiDirectional DC/DC converter charges a low side (12V) battery during normal operation (buck mode) and charges or assists the high voltage (48V) battery in emergency situations (boost mode). It is packaged in an unprecedented low profile 9.45” x 5.366” x 0.725” mechanically enclosed package weighing only 2.86 lbs. The 48S14.250BC converter is backed by Calex’s Five Year Warranty. For more information on the 48S14.250BC, view the data sheet at www.calex.com/pdf/bc.pdf or you can contact Calex at 800-452-3355/925-687-4411, www.calex.com or Fax 925-687-3333. Contact the Factory for pricing and delivery information. Calex’s corporate headquarters are located at 2401 Stanwell Drive, Concord, California, 94517 USA. All Calex products are designed and built in the United States. Medical, UPS-Ready, ATX Power Supply incorporates battery charger. Sinamics DCP 120kW DC-DC Power Converter comes with buck/boost capability. LED Driver offers 3,000:1 True Color PWM dimming. TDK-Lambda i3A Series Non-Isolated DC-DC Converters come in 19.1 x 23.4 x 9.6mm size.